Hubby's colleague has requested for me to help him fry some dry meesiam and this is what I have done for him. Did a small box separately for my mum and dad too. Since visiting my mum and dad today, I also made some redbean mooncake jelly for them as they like to eat jelly. I gave them two pieces of yam and two pieces of redbean mooncake jelly. The redbean paste was leftover when I made my dorayaki. 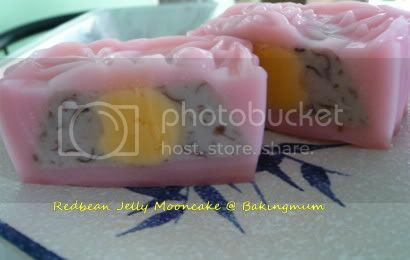 Your mooncakes are lovely and so is the mould. May I know where you get them from? I love to view your blog. 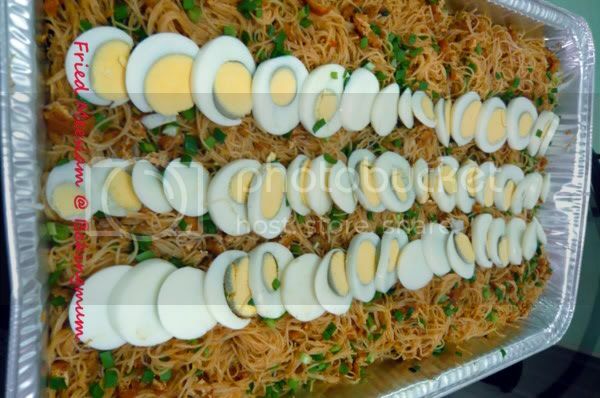 Can you share your mee siam recipe? The meesiam chilli is homemade. No actual measurements but I used shallots, garlic, lemon grass, blue ginger, candlenuts, balachan, fresh red chilli, red chilli powder, yellow ginger powder all grinded together. Cooked with lots of oil over medium fire for about 45 mins to 1 hr. 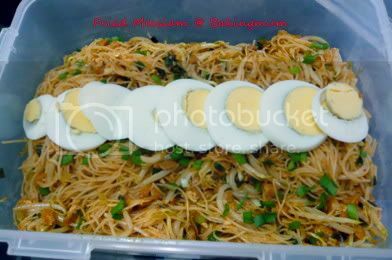 To cook the meesiam, you will need to add fermented soya beans, assam water, salt and sugar, the chilli paste, water, chives, taupok, taugay and beehoon. Fry the chilli paste first, then add in the assam water and the rest of the ingredients to fry the beehoon until the beehoon is soft and cooked. 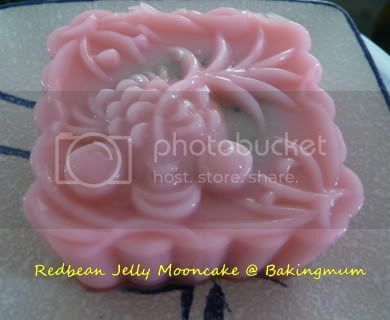 I bought my jelly mooncake moulds from Ng Meng Huat in JB. someone passed me a meesiam recipe a few weeks ago, with addition of coconut milk. i was hesitant about adding coconut milk, but then i thought might as well give it a try. i didn't like the result as it was too rich for me. i then went round asking nyonyas and some malays whether they add langkuas, lemon grass, kunyit and bunga kantan. all of them told me that it is not neccessary. just use dried chillies, dried prawns, onions, a bit of garlic, buah keras, blachan, tau cheo and sugar. i am still searching for a nice mee siam recipe. how does yours taste like? good? P.T., if I cook my mee siam with gravy, I do add in a little bit of coconut milk, not too much though. Mine was taught to me by my dad and I like it his style. It is a bit sourish, sweet and spicy. But if I make dried mee siam than there is no need to add coconut milk of course. Oh i love mee siam. My mom fries them every now & then for lunch or dinner or just a snack. Simple recipe at my blog too - which was my virgin attempt at cooking! Thanks for sharing your version too. your fried mee-siam looks nice..
Just love your Red Bean Mooncakes and would wonder whether you could share the recipe with us. Love your mooncake - good imprint and well coordinated colours of skin and filling. Simply stunning! I'm going to try your fried mee siam. Looks so good. Makes me home sick. I love your agar agar mooncakes. Do you sell them? I would like to get some for my family. wow! your daddy can cook too. i guess passion for cooking runs in the family. do you mind sharing with us your dad's recipe? 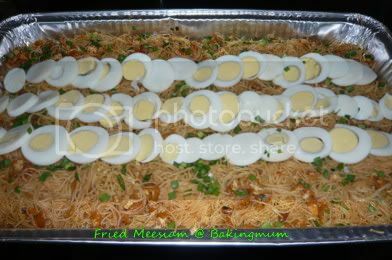 you have already shared your mee siam recipe in your earlier comment. your dad's recipe is with langkuas, kunyit, lemon gass etc. does he add in dried prawns? sorry for all the questions but i am eager to perfect my mee siam recipe. thanks. Thanks skinnymum for your great support. For those who want to make the redbean paste, you can go to the Dorayaki recipe to look for the method to cook the redbean, remember to cut down on sugar to your taste. Use this cooked redbean as your paste and follow the lotus paste jelly mooncake and you will get the same thing as shown here. PT, my dad did add hae bee. I fry some grinded hae bee with the chilli paste. As for the making of red bean paste, I just need to refer to the Dorayaki recipe right? Then follow by the recipe of the lotus paste mooncake, is it? By following the recipe, can make how many piece of mooncake?